Wound care solutions at your finger tips. Part of the VANTAGE360 from HARTMANN brand. Order, compliance and reporting through one easy-to-use interface. 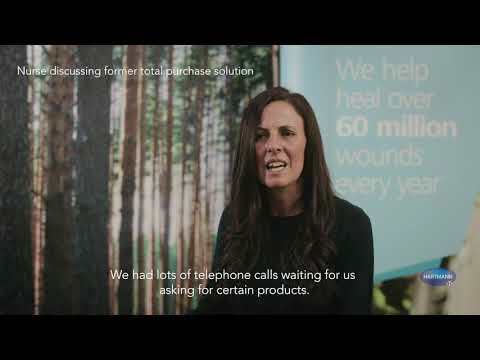 The total purchasing solution for all wound care products, removing the need for prescription. We are committed to making a more efficient provision of wound care a reality for everyone. HALO (HARTMANN Advanced Logistics Ordering) is the simpler, more efficient way to order wound care products. With the ability to order direct, products can be with you in just 24 hours with no prescription required. HALO lets you spend less time placing orders and more time focussing on what matters most – your patients. Our intuitive and easy-to-use total purchase solution enables you to access the wound care products you need, without a prescription. Let HALO optimise your ordering process and service, then feel the benefits throughout the wound care setting. Whether it’s saving costs by minimising waste, reducing the need for GP involvement, improving care closer to home or simplifying care provision in a nursing home, HALO drives efficiency where it matters most. Don’t take our word for it. Hear from Lead Nurse Tissue Viability and Infection Prevention, Julie Mullings. Complete the contact form below to request our HALO brochure and discuss with a HARTMANN Representative how our wound care solutions can help your service. Paul Hartmann Limited processes the personal data provided within this form exclusively for customer care. We will use this data to contact you and manage our business relationship with you. For this purpose, we might share your personal information with a responsible employee in the relevant country within the HARTMANN Group. Your personal data is not stored, transferred or used for any other purpose. The personal data is not transferred to any third parties outside the HARTMANN Group. The professional development network dedicated to your continuous and developing medical education in wound care. VANTAGE360 brands; HALO, PACT and LINK. With VANTAGE360, learn more about key aspects of practice, for smarter care solutions and improved clinical outcomes. Gain greater insights on the running of your service, CCG or Trust – for smarter decisions towards future solutions and further efficiencies.